The kitchen is the most commonly remodeled room in the home, and the counter and sink are the most frequently replaced items. When it is time to choose a new sink for your kitchen, you have many choices, not only in the material and shape of the sink but the configuration as well. Most sink companies have an array of varying sizes, with single and double bowl sinks being the two most common configurations. Both have their positive and negative attributes that may make one a better fit for your kitchen. 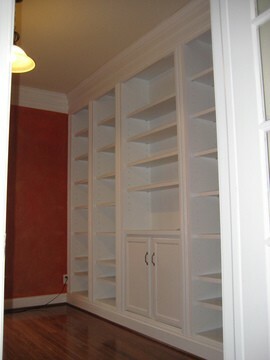 We will outline the differences between the two below, so you can decide which one will work better in your space. You probably use your sink more than anything else in the kitchen, so the size, shape, and number of bowls you choose is ultimately dictated by how you intend to use it. Single bowl sinks are often available in the same overall size as double sinks but have the added benefit of being available in a range of smaller sizes as well. While a double sink needs to be large enough to accommodate two bowls, single bowl sinks can take up relatively little space. So, for smaller kitchens or ones with a corner sink installation, a single bowl sink, such as the popular D-shape bowl, could be a better fit. Using a single bowl sink in a small kitchen maximizes counter space, providing more prep room and counter storage than with a larger sink. Finally, if your cabinetry uses a small sink base cabinet, you may find that you have more options for sink styles when selecting a single bowl because double bowl sinks require a larger base. Double bowl sinks also come in a range of sizes and configurations, from two bowls of equal size and shape to a large compartment with a smaller side compartment. This provides versatility in the way you use your sink. For example, you can use one bowl for prep and the other for washing, or you can use the smaller bowl for your garbage disposal, reserving the larger bowl for cleanup. It is difficult, however, to soak a large pan in a double bowl sink because of the partition between the two bowls. Therefore, single bowl sinks are more useful for things like washing large pots or babies, while a double bowl sink has more options for how to use the sink. If you use every inch of available counter space in your kitchen for storage, food prep, and decor, then double bowl sinks are useful with the second bowl. Using a double bowl sink with two large bowls gives you the option of placing a drying rack in the sink rather than on the counter. So, you can wash dishes in one bowl and dry them in the other without needing counter space. Some single bowl sinks have a built-in 1 drying rack on one side, but this reduces the washing space. The size of the sink is always dictated by the sink base cabinet, so when you have limited counter space, a double bowl sink may provide the storage and drying area needed. As far as the installation of the sink is concerned, there is little difference between a single and double bowl. Both sinks are held in place with epoxy 2 and sink clips. A large C-clamp will hold the sink to the counter while the epoxy 2 dries. 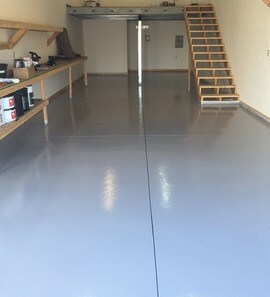 The difference in the installation is when it is time to connect the plumbing. Because a single bowl sink has only one drain, the installation is faster, easier, and cheaper. Placement of the faucet is also easier because there is only one bowl requiring water. Double bowl sinks have two drains, which need to connect to one another before entering the final waste trap. 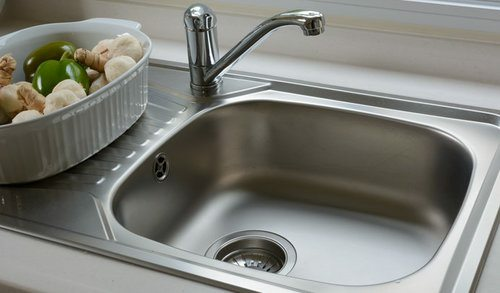 One side of the sink may have a garbage disposal, while the other does not, which increases the difficulty. In addition, having a double bowl sink raises the question of where the faucet will be placed. If both sides of the sink will be used for washing, the faucet needs to be located so that it can fill both sides. 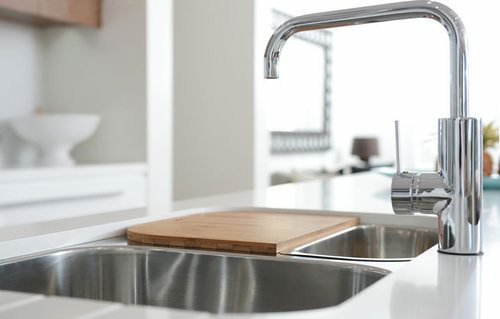 The cost of your sink is largely determined by the size and material, but double sinks typically cost more than single bowl sinks of the same size and material made by the same company. A 33-inch single bowl, stainless steel, undermount sink costs $219 on average, while a double bowl sink of the same size costs around $299. The average cost of installing a single bowl sink is around $144 for a total of $363, while the average cost of installing a double bowl is $174 for a total of $473. The increased installation cost includes the additional hardware necessary. Dishwashers are common additions to many kitchens and are installed near the sink for easy access. Either sink works with a dishwasher, although because you will not be using the sink for dishes, a single basin sink may be more useful for cleaning items too large for the dishwasher. Neither sink affects the use of the dishwasher, however. By and large, single and double sinks use approximately the same amount of water if you are using the entire sink. However, a double sink that uses only one half for washing may use less water. Because only half the sink is in use, it is possible to achieve a usable water depth without as much liquid volume. The same holds true for the amount of detergent. Your sink’s maintenance will be dictated by the material. Granite or quartz composite sinks require no additional maintenance. However, some sinks, which show wear more easily like solid surface or copper, may show wear marks on the partition between the two sinks of a double basin if you lean things like baking sheets against the top edge. This may require more cleaning to prevent stains. How much does it cost to install a single-bowl or a double-bowl kitchen sink in my city? Cost to install a single-bowl or a double-bowl kitchen sink varies greatly by region (and even by zip code). To get free estimates from local contractors, please indicate yours.